How NAFTA Helped The Mexican Billionaires' Club When the North American Free Trade Agreement was being negotiated, supporters promised it would increase the income of Mexicans. And the middle class did grow over the past two decades. But it's clear that the country's ultrarich are its big winners. 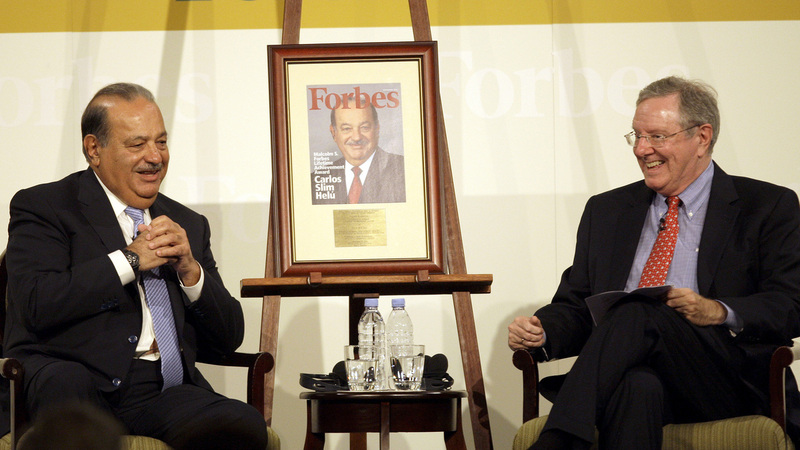 Carlos Slim Helu (left) talks with Steve Forbes of Forbes magazine. The magazine lists the Mexican telecom mogul as the world's richest man, with a net worth of $73 billion. Mexico now claims the richest man in the world — richer than Bill Gates or Warren Buffett. He has six times the wealth of Mark Zuckerberg — but nowhere near the fame. He's Carlos Slim Helu, 73, and much of his wealth comes from his cellphone company, America Movil, the largest in Latin America. His reach also touches the U.S., where his investments include a piece of The New York Times. The rest of Mexico's uber-rich are even less-known. They made their riches in mining, TV, Coca-Cola and beer. Forbes magazine puts the number of Mexican billionaires at 15; others say there are many more. Dolia Estevez, a contributor to Forbes, says many of Mexico's billionaires are old — in their 70s and 80s — and keep a low profile. "A lot of people avoid publicity, especially in a country like Mexico, where there are so [many] security problems," Estevez says. But Estevez says there are a lot of newcomers to the billionaires' club, too. There were five in the past year, most attributing their wealth to FEMSA, the largest Coca-Cola distributor in the world and Latin America's largest convenience store chain. Economist Luis de la Calle, who helped negotiate NAFTA for Mexico, says these billionaires have gotten wealthier in the past 20 years by what was not in NAFTA. The trade pact specifically excluded opening the telephone, television and transportation sectors. He says in hindsight, that was a mistake; NAFTA should have been more ambitious. "The sectors we did not open benefited the few," he says. Many of today's Mexican billionaires profited from those closed markets and built some of Mexico's most lucrative monopolies: Slim owns 70 percent of all cell service in Mexico and 80 percent of landlines; Ricardo Salinas Pliego and his family own TV Azteca, one of Mexico's two television networks; Emilio Azcarraga owns the other, Televisa. Economist Rogelio Ramirez de la O says it wasn't the intention of the government to create these billionaires. "If it had been planned it wouldn't have come so perfect," de la O says. During the NAFTA negotiations the government focused more on opening up the manufacturing sector, where jobs would be created. And de la O says the legacy of this wealth creation, inadvertent or not, continues to hold Mexico back. "At the end of the day, Mexico cannot grow and cannot compete because, among other reasons, it is being strangled by all these monopolies and oligopolies," he says. The top 10 percent in Mexico now own 40 percent of the country's wealth. But de la Calle counters that NAFTA did help narrow the gap between rich and poor. He says Mexicans are much better off now than 20 years ago. "Mexicans are now taller, they weigh more, they dress better, they're healthier," he says. And de la Calle says Mexicans now consume more. With NAFTA, prices went down and quality shot up for most goods, like washing machines, TVs and cars. But clearly not all Mexicans have enjoyed the consumer binge. Nearly half the country lives in poverty, earning less than $4 a day. And when it comes to banking, cellphones and television, Mexicans have limited access to credit at high rates, but they pay some of the world's highest cellphone prices and have few broadcast TV choices. Still, when you ask most Mexicans on the street about billionaire Carlos Slim, many don't deny him his riches. At a downtown sports bar, soccer fans cheer on Slim's soccer team. Fan Manuel Jimenez says he's proud of Slim. "It gives us a lot of pride that the richest man in the world is Mexican," he says in Spanish. It's true, says Eduardo Garcia, who runs the financial news website Sentido Comun (Common Sense); most Mexicans admire Slim, who has given a lot of money to local causes and does not flaunt his wealth like many of Mexico's elite. Garcia says, however, the government has failed to regulate these industries dominated by billionaires. It should have done more to enforce the laws so these titans can't run roughshod over competitors. "If you look at the industries in which they have become very wealthy and powerful people, they are industries controlled by one or two companies," Garcia says. According to Garcia's calculations — which differ from Forbes' — there are at least 28 billionaires now in Mexico, and he says that's not counting those in private industry who do not have to publicly account for their wealth. Despite its flaws, Garcia credits NAFTA with putting Mexico on the world stage and opening up its rich and its economy to more scrutiny than ever before. Economist and NAFTA negotiator de la Calle agrees. In fact, he argues that NAFTA and the stability it has given to Mexico will ultimately bring about a more egalitarian economy. "The NAFTA process is an economic policy that in the end has at its heart the interest of Mexicans, not the guys that have access to the government," he says. But de La Calle warns that 20 years is a short time to achieve the full benefits of NAFTA. It may take another two decades, he says.